I just celebrated my one-year anniversary! I started working for the NTA in March 2018. My current role is Marketing Manager. After completing the NTC program in 2016, I graduated with an immense amount of pride in my education and the NTA community I was apart of. 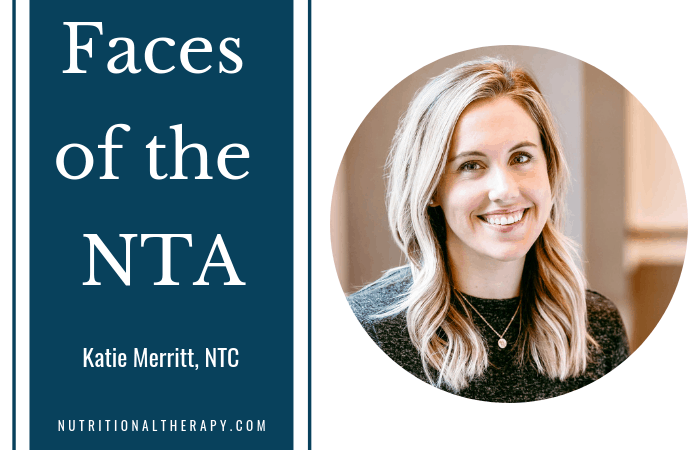 When the position became available, I knew without a doubt that I wanted to be apart of the NTA in different capacity where I could weave together my passion for nutrition and experience in marketing. I love the people. I have the privilege to work with some of the most amazing, talented, genuine people every day. People who truly care about the work they’re doing and the people they’re helping and empowering. I’m most proud about working with a small, yet mighty marketing team and accomplishing the ‘little’ things together every single day that become the building blocks to furthering our mission and reaching and empowering as many individuals as we can. I love how supportive our community is. We come together and unify behind each other and strive to push each other forward. Homemade mayo. Does that count? I’m the worst at following recipes! I almost always just throw whatever I have in the pantry together. But if I had to pick one, I do make these delicious superfood meatballs that I have (and use) a recipe for and I love to frequent Juli Bauer’s food blog. I’m currently reading/listening to three books: Woe is I, Woman Code, and It Doesn’t Have to Be This Way. I’ve worked in a holistic healthcare setting for the last 6 years and grew up with a chiropractic dad, and have seen the healthcare climate drastically shift the last few years. One of the biggest challenges I think we face is education. Stripping down the hoopla and educating the public on the basics and not being afraid of standing true in what we believe and how we can help and empower others.